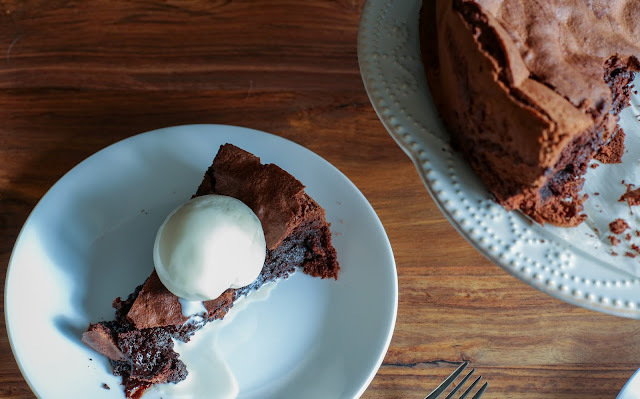 The other day I was craving a chocolate dessert and I came across this recipe on Food 52 for an ooey gooey molten-ish chocolate cake. 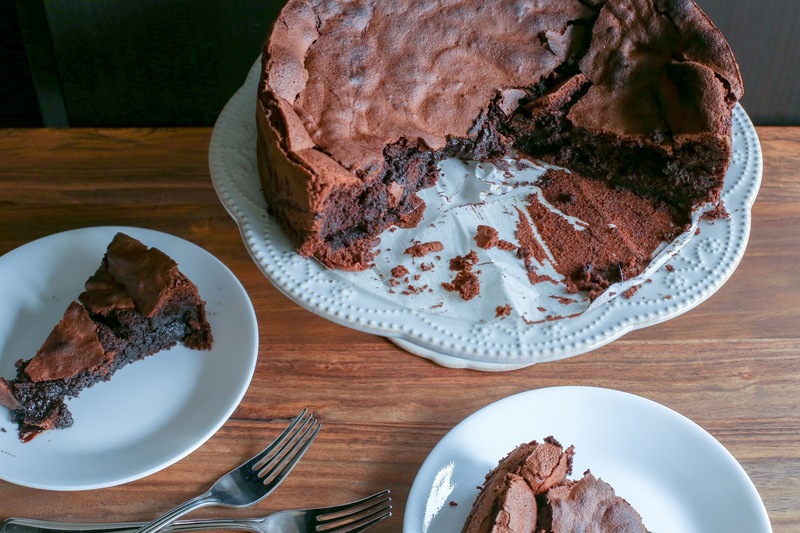 The article begins by explaining how difficult molten chocolate cakes can be to unmold and then goes on to say that the authors have created a foolproof recipe. It seemed like the perfect Friday night dessert. Of course I made the mistake of not actually reading the recipe instructions (which appear in a separate link). That Friday, as I began to make the cake, I was surprised that it wasn’t easy at all. It’s definitely no one-bowl chocolate cake! Wait, what? They want me to bake this cake twice and cool completely in between?? I followed the recipe amounts but I changed the baking instructions. 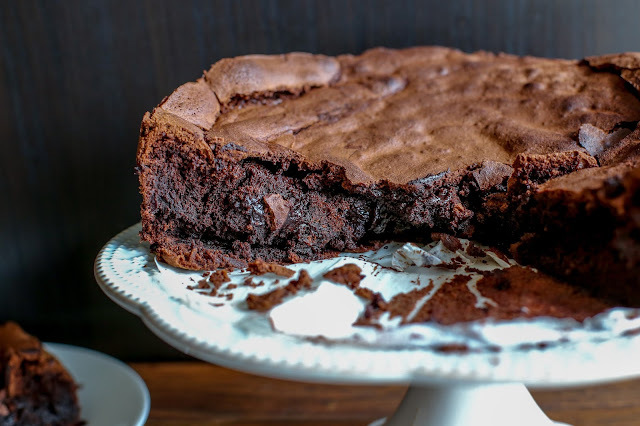 The purpose of their somewhat complicated baking strategy was to create a sort of chewy cake crust that could then be filled with remaining batter and quickly baked at high temperature a second time. 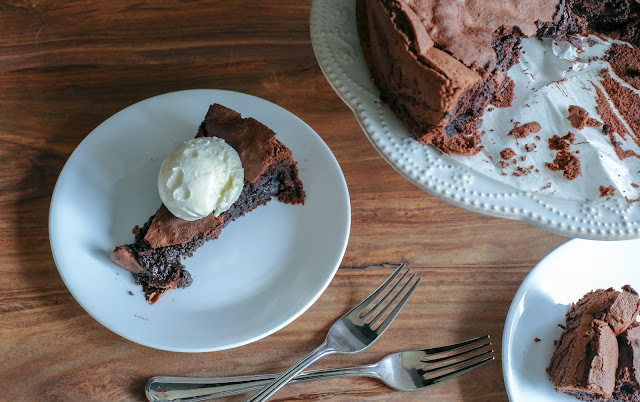 This would create a thin crust on top without actually cooking the filling, thereby creating a molten chocolate cake that could easily be unmolded. So I did the same thing… sort of. I baked the cake at high temperature first to set the sides and the turned the temperature down to bake the inside a little more without burning everything. It’s the same strategy many people use for fruit pies or roasting meat. When warm, the cake was soft at the centre and chewy on the edges. Maybe not quite as molten as the original recipe, but you could always decrease the final baking time to adjust to whatever level of moltenness you want (yes moltenness is a word). When it cooled, it became this light, melt-in-your-mouth fudgy mousse-like thing. Overall a Friday night success and sure to be a Valentine’s Day hit! Butter a 9-inch cake pan and line the bottom with parchment paper. Butter the paper and coat the inside of the pan with cocoa powder. Set aside. In a medium bowl over a pan of boiling water or with short bursts in the microwave, melt the chocolate and butter. Whisk in the cocoa powder and salt. Set aside to cool slightly. In the bowl of a stand mixer or in a medium bowl using an electric mixer, beat the egg yolks with 2/3 cup of the sugar until pale and light, about 3 minutes. Set aside. In another bowl, using clean beaters, beat the egg whites until soft peaks form. Gradually add the remaining 2/3 cup of sugar and beat until the whites are firm and glossy. Whisk the chocolate into the egg yolk mixture until just combined. In three additions, fold in the egg whites, being more gentle with each addition. Fold just until no white streaks remain. Pour batter into prepared pan and bake in the centre of the preheated oven for 10 minutes. Reduce the heat to 350F and bake for an additional 20-30 minutes until set on top and slightly jiggly in the centre when shaken. The jigglier, the more molten it will be. Let cake cool for as long as you can bear before serving. Cake is also delicious chilled the next day!